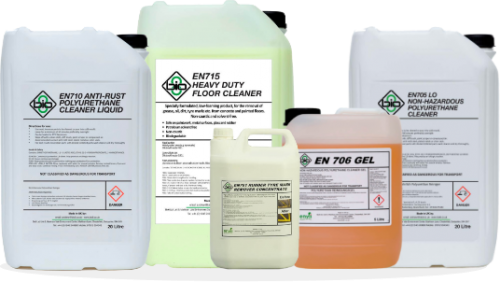 EN705 is a safe alternative for removing cured polyurethane from machinery, machine parts and mixer heads. Non-hazardous polyurethane remover that is recommend for use on stainless steel. EN705 Solvent free Polyurethane Residue Remover removes cured polyurethane based residues from machinery, machine parts and mixer heads. While Polyurethane is a strong and versatile substance, its durability can be a draw-back. No matter what you manufacture whether you produce car parts, mattresses or building materials, you will know the effort involved in keeping machinery operational and clear from PU residue. 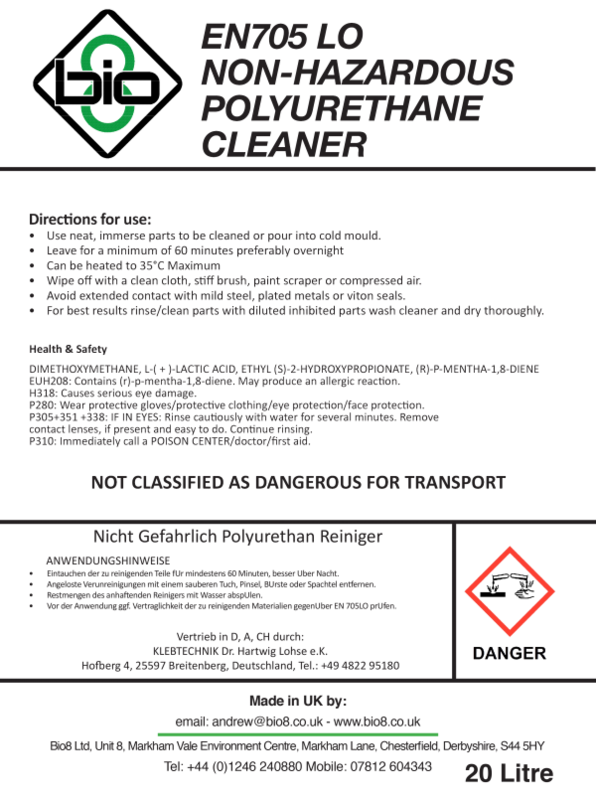 EN705 Solvent free Polyurethane Residue Remover is a liquid cleaner for use in low pressure polyurethane manufacturing. Its formula is designed to soak into cured Polyurethane and break its bonds causing it to soften and lose its structure. This leaves the PU residue weak and easy to remove. 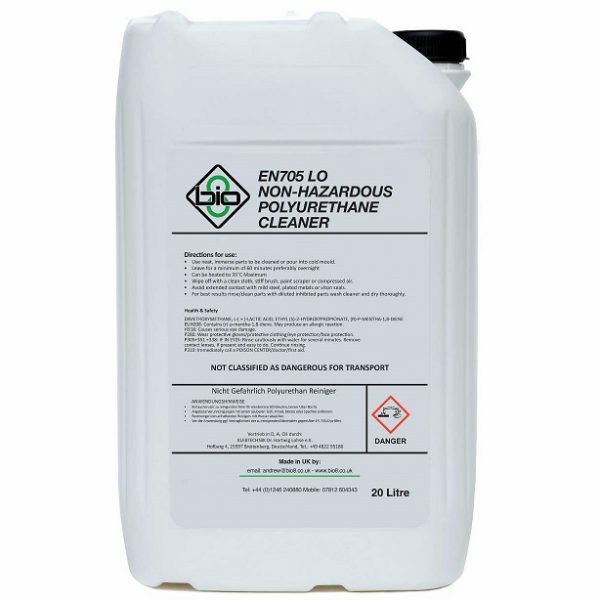 EN705 Solvent free Polyurethane Residue Remover does not use solvents or harsh chemicals. Despite its effective cleaning, it is very low hazard and is safe to both store and use without additional safety concerns. EN705 is ideal for cleaning detachable machine parts such as spray guns, nozzles and moulds. Parts can be soaked in a tub of the EN705 liquid as it is able to penetrate deep into built up PU residue. Returning them to an operate as if they were new. Traditionally many people will use harsh solvents like Methylene Chloride (DCM), NMP or NEP for removing Polyurethane. On the surface of it these can seem like a cheap solution. 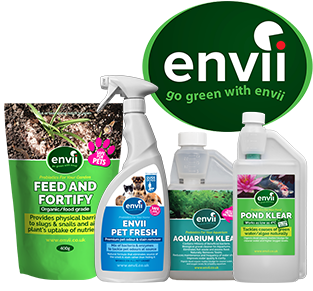 But these products present both a Health & Safety and environmental risk which carry many hidden costs both in use, storage and disposal. Furthermore, these products also are required in a much greater volume to give the same level of cleaning. EN705 Solvent free Polyurethane Residue Remover is the modern safe efficient alternative to solvent cleaners. Suitable for use on aluminium and stainless steel. What metals can this be used on?